Recently I passed my PMI-ACP exam. I had signed up for PMI Membership, which gave me access to PMI’s eReads and Reference library (discontinued by PMI), before the exam. 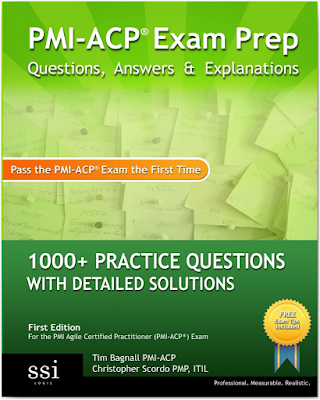 This book (PMI-ACP Exam Prep: 1000+ PMI-ACP Practice Questions with Detailed Solutions by Tim Bagnall and Christopher Scordo) was the only book on “Agile” in that library. I spent nearly 12 precious hours before my exam in attempting the questions on this book. In this post, I’m sharing my review of the book, and its usefulness for the PMI-ACP exam. This book is a collection of practice tests and only practice tests. There are a few exam tips at the end of the book, but that’s about all the extras that you get. The tests are organized into 20 lite mock exams consisting of 40 questions each, and 13 knowledge area based mock exams consisting of 15 questions each. In total it has 995 (20x40 + 13x15) questions. So strictly speaking, it does not contain 1000+ questions as claimed on the cover. Let’s start with the things that I liked about this book. It's FREE - at least For PMI members. That's a $50 saving right there. Update: The books is no longer free for PMI members as PMI has discontinued Books24x7. The questions are based on the 12 reference books for PMI-ACP. The answer explanations are quoted from the original reference, and the source of reference is also provided. It comes in both paper and digital formats. The latter is a boon for tablet users. I used it exclusively on my iPad. The eBook version in PMI's library provides links to jump from Question to Answer and from Answer back to the Question. This feature saves a lot of time that would otherwise be wasted in scrolling through the pages. Now those are about the only good things that I can say about this book. Let’s talk about the shortcomings. Too much repetition - it has only about 200 unique questions, and the remaining are variants and duplicates. Some questions are repeated as many as 15 times! I could easily score 90% on most exams, mainly because of all the repetition. I felt cheated when I took the exams. Quantity over quality - the focus was clearly on reaching the 1000 mark (and they still fell short by 5). It has basic editing errors such as duplicate answer choices in the same question. The questions are far off the mark, and do not resemble those on the real PMI-ACP exam. Unlike on the real exam where you are made to think really hard to select the best answer among two or more right answers, the answer choices on this exam rarely make you think - you either know the answer or you don't. Moreover, the real exam is full of situational questions, whereas this exam has hardly any. Poor answer explanations - the answer explanations are simply excerpts from the reference books. Contrary to the title of the book ("Detailed Solutions"), the answers are not detailed. They could be long but they do not explain why a right answer is right or a wrong answer is wrong. They are simply excerpts. Moreover, for questions involving calculations, the calculations are not shown. They simply give you the formula or tell you how to do the calculation. All the mock exams are almost of the same difficulty level. It would have been better to lay out the exams in ascending order of difficulty (low to high). In conclusion, the 12 hours that I spent on this book were a colossal waste of time. Even though the book is free, my time is not free. Though it has some good questions, they are few and far between. I’m sorry to use the harsh words, but I do not think that this book is an honest attempt by the authors. If you are preparing for the PMI-ACP exam, you might be better off with the free mock exams available online, or purchasing a good quality exam or two. I have no affiliation with the author or the publisher of the guide but if you purchase the book using the link above, I’ll get a tiny portion of the proceeds to help me maintain this site and enable me to bring more quality content your way. Which prep exam do you suggest? I have tried most of the free sample and practice exams and didnt feel they had the right content. Most of them had PMP questions and most of them had absurd questions. Is that the case in real exam as well? I would be taking up exam on the first week of April. I completed almost 13 exams of the 1000+ exams book as well. I dont mind buying a practice exam set if you think its worth or you happened to hear a good review of it from someone else. Sorry for the late response. I guess you may have passed your exam by now. But I agree with your comments. Currently, there aren't many good practice exams for PMI-ACP. Most of the exams that I'm familiar with are listed on the PMI-ACP Exam Study Material blog post. Do share your lessons learned and experience from the exam when you get a chance. Thank you for the write up man. Warming up to the idea of PMI-ACP. Kindly provide links to the free book from PMI. I am a PMI member. I'm a PMI member. How can i get this book for free? Unfortunately, PMI has discontinued Books24x7. Read my blog from earlier this month, on this topic. Now the best way to get this book is to buy it from sites like Amazon.